Home » Welcome » News » Congratulations Are in Order! Particle theorist Eliezer Rabinovici is among 5 scientists worldwide who've been awarded the American Association for the Advancement of Science's 2019 Award for Science Diplomacy. Five scientists who made central contributions to the founding and development of the Synchrotron-light for Experimental Science and Applications in the Middle East laboratory, an institution that has established an unprecedented level of scientific cooperation between political adversaries in a region formerly lacking a major international research center, have been selected by the American Association for the Advancement of Science to receive its 2019 Award for Science Diplomacy. Officially inaugurated in May 2017 at its facility in Allan, Jordan, SESAME is the first major international scientific center in the Middle East. The project’s establishment and ongoing success would not have been possible without the efforts of the five awardees: Hebrew University of Jerusalem particle theorist Eliezer Rabinovici, Jordan Atomic Energy Commission Chairman Khaled Toukan, Sabanci University (Istanbul) biophysicist Zehra Sayers, former Hamburg University experimental physicist Herwig Schopper, and former University of Oxford particle theorist Sir Christopher Llewellyn Smith. “SESAME is a remarkable example of how scientists can unify in the pursuit of knowledge, even among nations with longstanding political tensions,” said AAAS CEO Rush Holt. 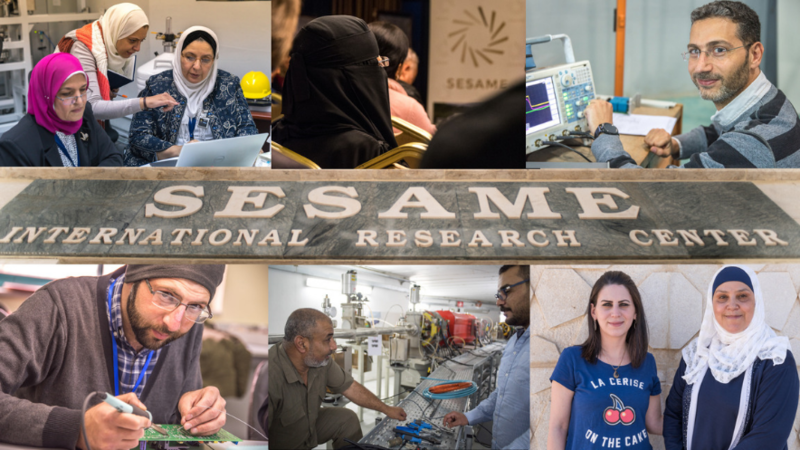 “The scientific enterprise in and of itself can promote peace and foster international collaboration.” SESAME’s current members are Cyprus, Egypt, Iran, Israel, Jordan, Pakistan, the Palestinian Authority and Turkey. Synchrotron light sources generate an intense light beam that can reveal the atomic structure of matter, making them a prized tool in biology, chemistry, archaeology and more. The month before SESAME opened its doors, for example, a synchrotron light source at the SLAC National Accelerator Laboratory in California revealed new details about the structure of proteins that regulate blood pressure, a discovery that could lead to better hypertension treatments. This potential for innovative research in diverse fields makes a synchrotron light source the ideal basis of the Middle East’s first major cooperative scientific facility. At SESAME, teams of researchers from all member states have begun carrying out experiments, which has the potential to promote the development of varied scientific fields in their home countries. The idea of an international science effort in the Middle East was born in the mid-1980s, when physicist Abdus Salam, a Pakistani Nobel Laureate, suggested establishing a synchrotron radiation facility in Bahrain. Politicians in the region were enthusiastic about the idea, but it lost momentum over the next decade. A resurgence of optimism followed the 1993 Oslo Accords, when Israeli Prime Minister Yitzhak Rabin shook hands with Palestine Liberation Organization Chairman Yasser Arafat in front of former U.S. President Bill Clinton. Rabinovici, one of the AAAS Award for Science Diplomacy recipients, and the late theorist Sergio Fubini, both then working in suburban Geneva at the European Organization for Nuclear Research (CERN) — the world’s largest particle physics laboratory — brought colleagues together to found an organization called the Middle Eastern Scientific Cooperation group. Soon after its formation, MESC hosted an international physics conference in the town of Dahab, on the Sinai Peninsula. The meeting took place in November 1995, a few weeks after Rabin was assassinated by an Israeli extremist who opposed the signing of the Oslo Accords. Rabinovici went on to be instrumental in the formation of SESAME, securing Israeli participation in the endeavor, and he is a current member and former vice president of the SESAME Council, its governing body. Sayers and Toukan, two of the other awardees, also played invaluable roles in obtaining support for SESAME from their respective countries, Turkey and Jordan, and providing scientific leadership. Sayers chaired the organization’s scientific advisory committee for many years, and Toukan now serves as SESAME’s director. The final awardees, Schopper and Llewellyn Smith, are both former directors of CERN and former presidents of the SESAME Council. Serving as the first chair of a MESC steering group, before SESAME had a name, Schopper led the creation of a framework for cooperation among the countries involved. By the end of his term as SESAME Council president, the project had an established structure for cooperation with a site in Jordan, a training program for researchers and engineers from member states, and some of the components for an accelerator. Like his predecessor, Llewellyn Smith played a pivotal role in guiding the project through political obstacles. In 2010 alone, a number of incidents threatened to upend the initiative’s progress. In that year, Iran’s government accused Israel and the U.S. of involvement in the killing of two Iranian scientists connected to SESAME, and there was a violent clash between Israeli commandos and a Turkish-owned ship off the coast of Gaza. Thanks to the interventions of SESAME Council delegates, under Llewellyn Smith’s leadership, the project continued. Likewise, faced with the potentially crippling electricity costs of running such a high-power laboratory, Llewellyn Smith helped secure support from the European Union to build a solar plant. In 2019, SESAME is expected to become the world’s first solar-powered accelerator. The AAAS Award for Science Diplomacy was established in 1992 as the AAAS International Scientific Cooperation Award. It recognizes an individual or group in the scientific and engineering or foreign affairs communities making an outstanding contribution to furthering science diplomacy. The award consists of a commemorative plaque and an honorarium of $5,000, which this year’s recipients have decided to use to help fund the work of a young scientist at SESAME.